If I have realized one thing in the evening of my life, it’s that smart people are few while the not-so-smart number in the billions. Wherever you live, a good, secure computer with Internet connectivity is a must these days. But most of us do not need a iMac with Retina 5K display with an obscene price tag of $2,500. Or a Windows 8 systems where even finding the “Start” button is an ordeal. So this year on Black Friday, instead of lining up in the cold at Best Buy, Walmart or Staples like all those not-so-smart people, why don’t you be smart (or at least act smart) by sitting at home in your pajamas and pamper yourself with a bunch of nice open source gifts. Your cost will be less than $150 (monitor excluded) for a secure Linux desktop computer with a bunch of important applications. * Dell Optiplex 780 SFF – These are used business computers easily available on eBay or Craigslist. For those of us not into molecular designing, heavy online gaming or graphic intensive tasks, these SFF (small form factor) workhorses are more than adequate. They usually come with Intel Core 2 Duo E8400 3.0GHz processor, 4GB memory, 160GB hard-drive and Windows 7. Pricing ranges from $100-$149 depending on memory, hard-drive size and whether it has Microsoft Office installed. My suggestion is to pay no more than $130 and get a system with 4GB RAM and 160GB-500GB hard drive. (If you have money to burn, go for faster systems like Dell Op[tiplex 980 or 990. They’ll run you a couple of hundred dollars more since they come with current Intel i5 or i7 quad-core processors.) But Dell Optiplex 780 is good enough for routine tasks. Optiplex 780 SFF is Bluetooth enabled and my Logitech wireless mouse and keyboard run without issues. Once you get the Optiplex 780 computer, install the following software (some of them like LibreOffice, Firefox, Thunderbird may already be installed). By the way, Optiplex 780 comes in three sizes – Tower, SFF and USFF. My recommendation is to go for either SFF (small form factor) or USFF (ultra small form factor). They won’t take much space. Vector drawing application Candy Apple is now available at the Mac App Store for a mere $1.99, a discount of 93% over its usual price of $29.99. Use Candy App to easily design creative artwork and illustrations, enhance photos and add jazzy effects. You can enhance pictures and add effects, draw illustrations and graphics, convert text to a shape or path, adjust freehand drawing to create smooth looking paths, vectorize images to turn any photo into an editable graphic, apply 130 filters and effects to images on the canvas, combine shapes using Boolean operations, import SVG graphics and edit their vector paths, export as an image (JPEG, TIFF, PNG, BMP, GIF) or a vector PDF and lots more! Grab Candy Apple at the Mac App Store for $1.99 before the deal ends! Chronicle bill manager is available at a sweet 87% discount for the Mac platform at the Apple AppStore. Usually $14.99, Chronicle is available for a very limited time for just $1.99. 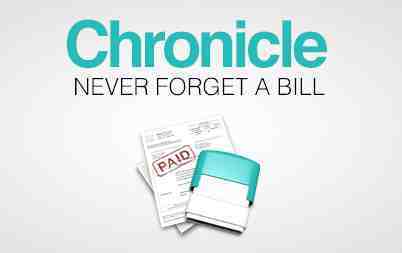 Chronicle promises to remove the hassle out of managing and paying bills. Chronicle will remind you when bills are due with alerts that can be synced to an iPhone (iOS version of the app is $2.99) and across all your Mac computers via iCloud or DropBox even when the app is not running. Besides reminders, the app also lets you pay bills online via its integrated browser and stores confirmation numbers and receipts. Chronicle comes with a feature that graphs payment history and averages your payments to let you better budget for bills that fluctuate, stuff like utilities or credit cards. Chronicle requires OS X 10.8 or higher. The 87% off deal ends Wednesday evening. So get cracking if you want a nice bill manager at a ridiculously low price. I’m planning on getting the app myself later tonight. Good apps like Diagrammix for the Mac are not cheap. Fortunately, I stumbled upon a deal at the Mac App Store for this neat diagram creating app a short while ago. 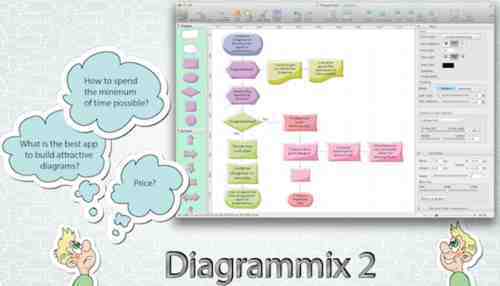 Diagrammix is on sale today (April 8, 2014) for $1.99 at the Mac App Store. The app is usually $19.99. So with a discount of $18 you’re getting a good deal. Diagrammix lets you build attractive diagrams easily by dragging and dropping elements from the palette. You can use pre-built styles of elements and connectors or create your own styles with custom colors and shapes. There’s also an option to drag or drop images from other programs into Diagrammix. Once you’ve completed the diagram, it can be saved in a number of formats including JPEG, PNG, TIFF, PDF or copied to your word processor via the clipboard. Diagrammix comes from Moscow software firm Deep Information Technologies (Deep IT), an app developer for the Mac and iOS. I’ve checked out a couple of “How To” videos on Deep IT’s web site for Diagrammix and the app seems like an easy to use tool. The app is said to support different kinds of diagrams including flowcharts, data flows, workflows, UML class diagrams, organization charts and structured charts. Diagrammix provides for in-app purchase of two smart connectors ($4.99) and one vector tool ($4.99). You can extend the tools by importing sets of shapes from Graffletopia. As of April 8, 2014, the version of Diagrammix is 2.9.4. The app supports OS X 10.6 or later. The $1.99 deal ends today (April 8, 2014). I’m sufficiently impressed with the Diagrammix app and the company’s videos and support pages that I’ve just purchased a copy of the app for myself for $1.99. I plan to use the app to create diagrams with attractive apps for my various blogs. A few minutes back, I downloaded Diagrammix for my Mac (10.8.5) and played with the app for a few minutes. I’m happy to report that the app works fine.